Learn the process of self-myofascial release through foam roller exercises to heal your body, mind and soul! Sore forearms and hands are body metaphors for how well you 'handle' things in your life! The process of foam rolling can be more than just a mere physical exercise. It can be used as a tool to understand where you hold your tension in your body through a process called self-myofascial release. When you start a foam rolling program, you will quickly learn where you manifest your stress and just how much you are unbalanced. Exactly how and where you hold your stress, is your unique body-mind-soul signature and is a result of many years of habit. Emotions clearly effect our bodies and each and every day, if you become more body aware, you will see the proof of this in your own body. With foam roller exercises, you can locate in a matter of seconds where your muscle kinks are in your body. Some of these kinks you know about, like the ones in your shoulders and neck, but others you will discover as you foam roll. You may be very surprised how much muscle tension you are carrying around! If you are interested in a foam roller, I recommend the EVA high-density, textured models. These are premium-type models that cannot be found in a retail store, but must be purchased online. Even the discount stores now offer basic high-density models, but they are not textured nor as comfortable. If you plan to foam roll more than just your arms, you should buy the premium type and get the full 36 x 6 in round size. This size and style is the most versatile for all your foam roller exercise needs. The forearm is a complex system of small muscles that extend and flex the wrists, hands and the fingers. The muscles in the forearm also move the wrist from side to side (adduction and abduction). The brachioradialis is also a major muscle in the forearm. It is a powerful flexor muscle that assists the biceps and the brachialis to flex the elbow. It is the fattest visible muscle on the thumb side of the forearm, just below the elbow. When you learn about the forearms, overuse of this area results in one of the most common body-mind-soul conditions of all: carpel tunnel syndrome. The carpel tunnel is a tight passageway for the median nerve, as it travels through the wrist to the hand. The tunnel is created between bones and ligaments of the wrist. If the median nerve becomes pinched or swollen, it can cause numbness and pain in certain fingers in the hand. While various experts disagree on the cause of carpel tunnel syndrome, and some even refute that it is due to a repetitive motion injury, it is true that women are more susceptible. In my practice as an occupational health nurse, the single most frequent at-work injury involved the wrist and repetitive motion issues. My practice was in a research hospital, and it was mostly research scientists and office workers that sustained this type of injury. Repetitive motion injuries of the wrist and hands were almost always issues of the body-mind-soul. If I counseled the worker regarding changing work habits for frequent rest breaks to do stretching, and varying their work tasks to break up the repetition, gave them medical treatment and improved their equipment to be more ergonomic, they did not always get better! It was most often about the stress in their work situation, the inability to make changes to relieve their stress, and the inability to understand the emotional connection that made them resistant to healing. Often it seemed like the only solution for the employee was to pull them off work: A very dangerous thing to do when someone’s heart was truly not into his or her work. Getting such an individual back to work was usually a real problem, because we did not treat the emotional issues as to why the worker did not want to work. The use of body metaphors is a very common occurrence in the cultures of the English language and is a reflection of our cultural awareness of the mind-body connection. Our hands are a highly significant part of how we sense the world. We handle things and touch things to better experience them. The body metaphor for the hands, is regarding how well we handle things in our lives. If you are experienced in something, you ‘know firsthand,’ or you know something ‘like the back of your hand,’ you are an ‘old hand’ or ‘handy’ at what you do. If you are not experienced, you my ‘try your hand’ at something, or if you did try but failed, you may ‘throw your hands up’ in frustration. The whole arm and/or elbow may also be involved in hand, wrist and forearm issues, so you may also want to read about the body metaphors of the upper arms as well. Since your arms embrace things and hold things, (or fail to do so) you may wish to read about the Upper Arms and the foam roller exercises for them. I lovingly handle all things in my life and create love and joy! I release my grasp on all things and allow the abundant flow from God/the Universe! I share my knowledge and give others a hand whenever I can! I release my grasp on money and create a giving flow that comes back to me abundantly! I believe in abundance for me in all things! I am in safe hands with God/the Universe! God/the Universe supports me in all things, monetarily, physically and emotionally! Remember that when you roll your muscles, it is the process of self myofascial release that is bringing your awareness to your particular muscle knots. You wil know when you find these knots, because your arm will be sore in this area. When you roll onto a sore spot, stop there and hold the pressure here for a minute or so. Try to hold this pressure until you feel the muscle release. Breathe deeply as you hold this pressure and send your energy to this area. When you become body-aware and focus on these areas of soreness, you may discover that the long held stress here, when released, will release held emotions as well. All foam roller exercises are adjustable, so you can customize it to your body's needs. You can apply different levels of pressure from one area to another and vary the amount of time you need rolling each individual area. Lean one way or more the opposite way to get to a sore area. Your body weight itself provides the variation. If one side is tighter than the other, spend more time rolling that side. It is, however, important to roll both sides of your body to maintain your balance. It is imperative that you stay focused on those sore spots in your forearms, wrists and hands as you do these foam roller exercises. Stay open and aware at all times, so that you will "hear" the message your body is bringing you. Since you are doing the exercises like yoga, in a mindful and relaxed state, don't forget to breathe deeply as you do them. Don't do any movements that make you hold your breath. When you are deeply breathing, the body is given the message that you are in a relaxed state. If you hold your breath, your muscles will tense up and fail to release. If this area is painful, preventing the deeper breathing, ease up on the pressure until you can breathe evenly and deeply again. As you grow accustumed to the movement and the pressure, breathe even more deeply, sending your attention to that area. This will allow you to move even deeper into the muscle. 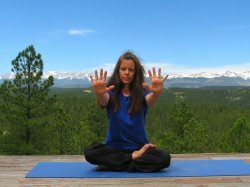 Tell your forearms that it is OK to release and let go. This release, when it happens feels great, and you will feel the emotional letting go of the tension as well! Release your need to control and grasp onto things too tightly. Just let this need go. Instead, open your heart and your forearms to let in hope, joy and abundance. All movement that is done intuitively, can be personalized, so make my foam roller exercises and their descriptions a starting point only. Intuitive movement never pushes through pain that is more than moderate. Remember that pain is a message to you that something is wrong. If severe pain exists in your forearms, wrists or hands, along with any numbness, seek medical attention. You can read the instructions prior to viewing the video below, or just skip to the video. For the foam roller exercises that I show here, feel free to use foam roller of any size, as long as it is round. First Foam Roller Exercise for the brachioradialis and wrist extensors: Stand or sit by a table. Place the foam roller on the table, and place your arm out straight and perpendicular to the foam roller. Rotate your arm so that your thumb faces downward. Rotate it even farther if you can so the palm is up to the sky with your thumb toward the back. Locate the foam roller under the fat part of the muscle just below the elbow. Roll up and down along the entire length of your forearm, pausing and holding pressure on any sore spots that need your attention. Hold the pressure for about 30 seconds or so. Roll on the entire muscle again, then come back, once again to the sore spot and re-apply the pressure for another 30 seconds. Keep breathing and sending your breath to the area that is knotted and sore. Second Foam Roller Exercise for the brachioradialis and wrist extensors: Perform the exact same movement, only now on the floor. This position may or may not be easier than on the table, for you. Pick the one that is easier. Kneel on the ground with your arm out perpendicular to your body and the foam roller. Use the opposite arm to push your upper body back and forth as you roll up and down the brachioradialis and wrist extensor muscles. Third foam roller exercise, for the wrist flexors, also done on the floor, kneel on the ground with the foam roller in front of you. Position the roller under the bottom of your forearms, with your palms facing each other and thumbs up. Roll up and down the forearms. You can rotate the forearms in all directions to hit the flexors and the extensors as needed to hit any sore spots. You may follow up with forearm and wrist stretches to enhance your foam roller releasing exercises. Just about any arm stretch will also stretch your forearms. You may also want to see the stretches and foam roller exercises I offer in my article for your upper arms. I have added some additional wrist/hand stretches you may want to try as well. For the first two stretches, hold your arm out straight in front of you. First bend your hand down at the wrist, with your palm towards you. On the second stretch, place your palm out. Repeat on the other side. On the third stretch, spread your fingers as wide as you can. 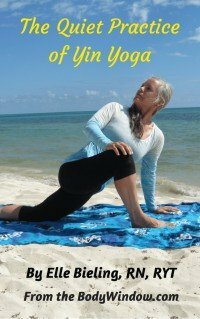 It is my hope that you will enhance your body awareness through your body-mind connection, when you practice the stretches and foam roller exercises for your your forearms, wrists and hands. May you always journey towards fuller body, mind and soul health!